Celebrating 3 Years in Business! This July is our 3rd year in business as your favorite Costa Mesa Dentist! From the bottom of our hearts, we cannot thank our patients, families, and friends enough for all of their love and support. 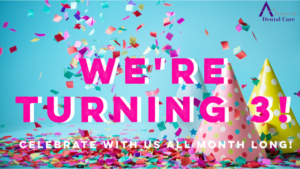 We are celebrating all month long with patient rewards, daily prizes, and a special 30 Days of Giveaways contest! Our friends in the community have donated some AMAZING prizes for our patients to win. Each day we will post a new prize on our social media accounts. You can enter to win the following prizes by clicking on the item name! Day 2: Pur Gum Gift Box – WINNER: Andrei H! Day 3: 18/8 Fine Men’s Salon Gift Bag – WINNER: Max F! Day 4: $100 Gift Card to MilkandEggs.com – WINNER: Brendan M! Day 5: Family Pack Regal Theater Movie Tickets WINNER: Andrei H! Day 6: Waterpik Water Flosser – WINNER: Easton F! Day 7: Two Free Meals – Halal Guys – 5 Winners – WINNER: Azen S! Day 8: $30 Gift Card to Nectar Clothing – WINNER: Rebecca C! Day 9: Studio A Hair Salon Gift Bag – WINNER: Deepak S! Day 10: One Week Free Meals from Prepped by Bec – WINNER: Allison S! Day 11: Free Massage with Exam from Garcia Chiropractic – WINNER: Garrett K! Day 12: Mindfulness Gift Bag with $50 Gift Card to CorePower Yoga – WINNER: Rebecca C! Day 13: 30-day Free Membership – Burn Body Boot Camp – WINNER: Marcus G! Day 14: Anti-Aging Facial by GLO Wellness MD – WINNER: Colleen P! Day 15: Designer Series Waterpik – WINNER: Brianna G! Day 17: 32″ Samsung LED TV – WINNER: Gina M! Day 18: Oral-B Electric Toothbrush – WINNER: Manuel F! Day 19: Aqua-Tots Gift Basket – WINNER: Jayme B! Day 20: 3 Sessions of Contour Light Body Sculpting – Newport Beauty and Wellness – WINNER: Caitie N! Day 21: One Year Free Membership Fermentation Farm – WINNER: Brendan M! Day 25: $50 Gift Certificate to Mesa Lounge – WINNER: Lia B! Day 26: Zoom! Teeth Whitening – WINNER: Titus Y! Day 28: Halal Guys – Two Free Meals (3 Winners) – WINNER: Wesley N! If you are an active, existing patient (seen within the last 365 days), you can enter to win any or all of the prizes. If you are a new patient, you must schedule an appointment at our office and attend the appointment in order to receive the prize if your name is drawn. This giveaway is for patients only so you must become a patient in order to win. This giveaway is for patients of Advanced Dental Care. Anyone may enter, but in order to win, you must be an existing, active patient seen within the last 365 days at our office. If you are a new patient, you can enter the contest by scheduling an appointment at our office. If your name is drawn as the winner of a prize, you will be notified by the contact information you have provided. If you are not an existing, active patient, you must attend your scheduled appointment to receive the gift otherwise you do not qualify as an active patient. New patients who do not show up for scheduled appointments will forfeit their prize. For more information, please email us at info@mycostamesadentist.com.